WARNING! DON’T OPEN FOR SPOILERS! Let’s get right on with the recap! The drama opens with what appears to be a car chase. 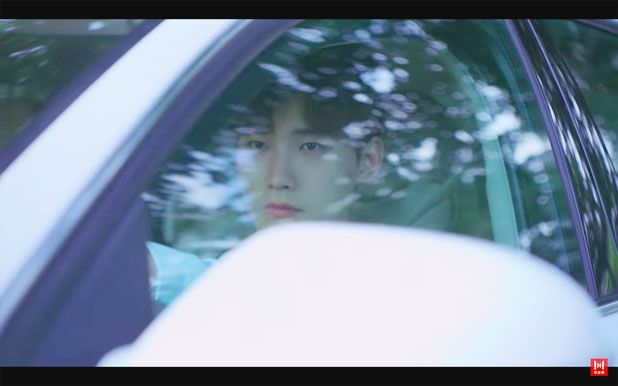 The camera pans into the white car, and we see our male lead, Mo Lian Cheng (Xing Zhao Lin) attempting to drive as fast as he can, but also keeping watch on the cars behind him. They arrive at the top of a cliff, and Mo Lian Cheng runs at full speed yelling out Tan Er (Liang Jie) just as she jumps off into the ocean. The camera also focuses on this one high heel that is left on the ground near one of the cars. A mysterious figure that is dressed in complete black also stands near the cliff. She sees Tan Er jump, yet makes no motion to stop her. The lady eerily stands there, and Mo Lian Cheng doesn’t seem to see her there. 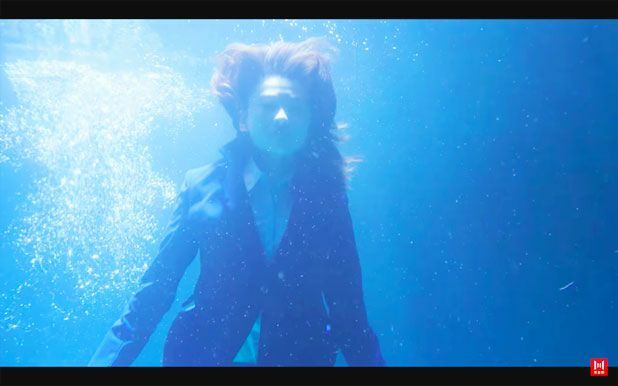 Tan Er’s body falls into the body of water and slowly sinks, however her eyes are wide open. 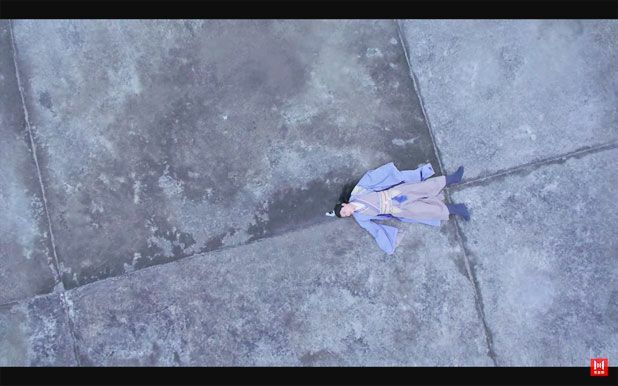 The camera fades black but soon zooms in on Mo Lian Cheng’s body lying on the ground, except this time he’s dressed in historical clothes once again. (I think this is the part that connects to the ending of Season 1, except he’s dressed historically) Mo Lian Cheng calls out Tan Er’s name and slowly stands up, and we see that he’s in a city. All around him are skyscrapers and he looks out of place with his attire. In the end of the first season, when they were both fighting the Demon King, Tan Er was sucked into the fissure of time and space and disappeared from Mo Lian Cheng’s side. Somehow, he was sucked into the modern times and realized he has arrived on a unfamiliar earth. He searches for Tan Er but does not find her, yet realizes that this is her hometown. Not only was space distorted, but time too, as the Tan Er he is now looking at is the past Tan Er. The one who hasn’t been sucked into historical times or the one who became the 2nd Miss of the Qu Family. Despite this, Mo Lian Cheng promises to protect this Tan Er, especially since he’d already searched so hard for her. To him, nothing is more important than being together with Tan Er. (Aww this is too cute!) Time unfreezes, and Tan Er turns to look at Mo Lian Cheng. With a sweet smile on her face, she turns and asks him he’s looking to buy a house. The next scene is somewhat odd (at least in my opinion) because it shows a set of curtains, and then a pair of feminine feet walk by, which we assume is our female lead, Tan Er. She’s wearing a pretty pink flowy pajama set, as the camera shows her putting on lipstick and mascara. We see her lie on the bed and wink at the camera (hahaha, what’s she trying to do here!) And being the typical girl she is, she presumes to take selfies in multiple different poses on her phone. The following scene is even weirder, as Tan Er lies on the floor with a single blanket and two pillows to prop her up as she relaxingly drinks . . . milk out a wine glass. Next to her feet is a gigantic bowl of spicy meatball soup, which she enjoys before she’s interrupted by a couple and a real estate agent. Apparently this isn’t the first time this has happened as she answers a call from a manager. He tells her to stop messing around with the houses they’re planning to sell, to which she promptly promises will never happen again. She explains her situation stating that the water heater in her house was broken, and she thought it would be fine if she took a shower here. Her manager, clearly unhappy with the situation, tells her to hurry back to the office to get her files because a big client of theirs was looking to buy a mansion. (Ooh, I bet the client is Mo Lian Cheng) She gets ready to go on her motorcycle, which appears to be broken as it makes high pitched wailing sounds. Tan Er has arrived outside of the mansion, but doesn’t see the big client she’s suppose to meet up with. She calls him and we hear her address him as Mr. Mo. She introduces herself as Qu Xiao Tan and asks why he’s not home while explaining that his doorbell is broken. She realizes that the other end is silent and assumes the service is bad, but in reality, he’s in the car she’s currently sitting on. Mo Lian Cheng makes his way out of the car and tells Tan Er that he has forgotten the keys to his house, to which she replies, “You have a door code” (Lol @ her face when he tells her he forgot the passcode) He asks her if she’s good at climbing over walls, to which she replies that she’s the best at. Tan Er kicks off her heels and uses all her might to throw herself onto the wall, reminding herself that she must be patient and that it’ll all be worth it as soon as she receives the money. Just as she’s struggling to barely hang on to the wall, Mo Lian Cheng walks in through the front gate, stating that he finally remembered the passcode. 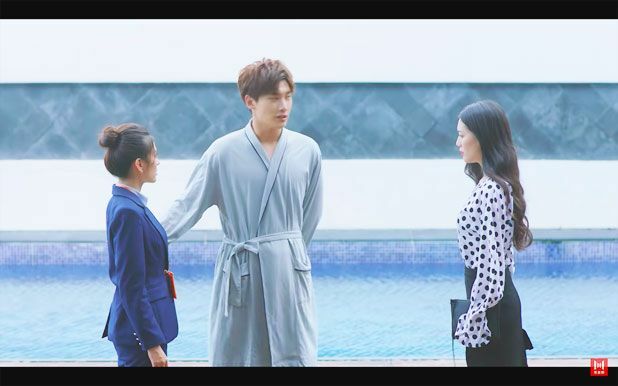 (Ahaha, poor Tan Er~ Although major throwback to Season 1 as this directly mirrors one of the first scenes in which they meet) In the modern version, she calls him a sissy too and accidentally falls off the wall, to which Mo Lian Cheng catches her this time! 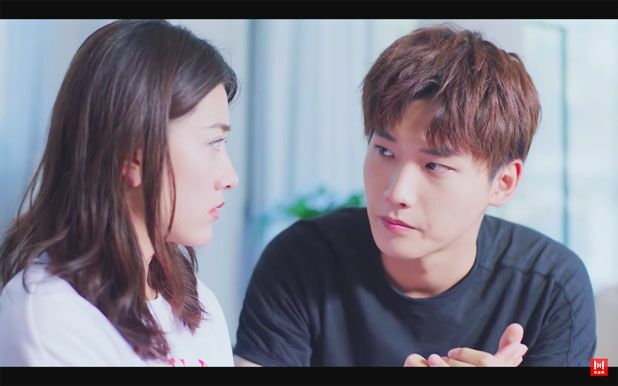 She’s clearly shocked at his proposal, and accidentally squeezes his chest (hehehe) Mo Lian Cheng’s eyes travel down to where her hands are positioned and the look on his face is priceless. He explains that his motives are to buy another house, which he can’t do unless he marries someone from the area. He sees her hesitation and retracts his offer, allowing her to think it through, meanwhile he walks off to practice calligraphy. Tan Er happens to know how to rub ink and offers to help him in hopes of getting the contract finalized. They stay in silence for quite some time, and hoping to get a response from Mo Lian Cheng, Tan Er “accidentally” gets some ink on his shirt. While helping him rub it off, she pulls on his shirt, revealing a dark purple and black rose mark. 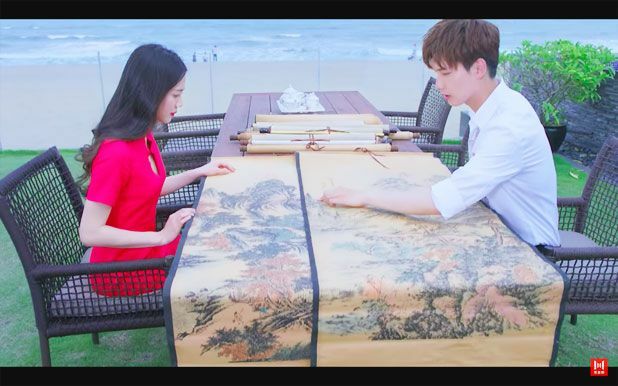 She offers to wash his clothes, and once she’s done, Mo Lian Cheng has already finished taking a shower. In the midst of their conversation, a girl appears, calling Mo Lian Cheng’s name. She looks like the same girl who had been going over antiques with him in previous scenes. Tan Er steps out to explain the situation, however Mo Lian Chen interrupts her, introducing her as Lin Ke, a work partner. Except at the end he adds that Tan Er is to keep their private matters to themselves. The scene changes and we see Tan Er at home, dressed in casual clothes, relaxing on her couch. She grabs her phone and starts updating a post. 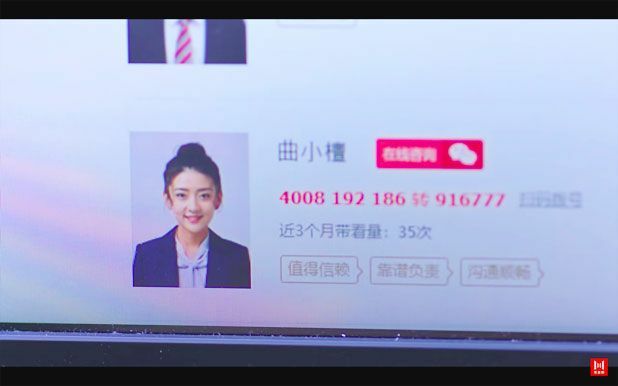 She lists Mo Lian Cheng as the New Client, but adds on that he’s a perverted young mean man, making sure to state that he should be a warning to my co-agents. Speaking of the devil, a phone call appears listed as Your Ancestor, and Tan Er questions to herself whether he could have saw her post. (Lol he’s listed as Your Ancestor in her phone xD) She answers the call, only to have him tell her that he’s currently parked downstairs from her house and that she should hurry down. Tan Er calls him crazy, but still hurries out the door. 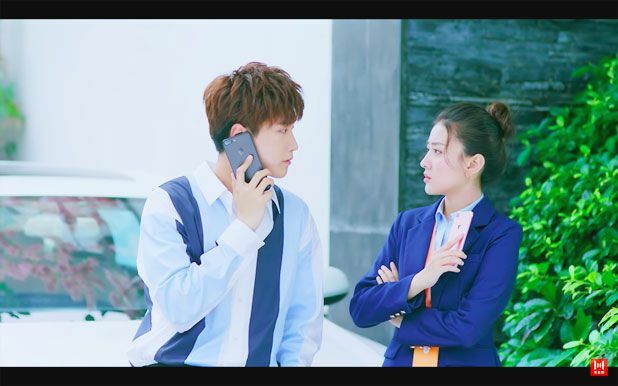 Mo Lian Cheng fails to answer her questions, and Tan Er has no choice but to get into his car. The moment she sits down, he swoops in and his face get within inches of hers. (Is it gonna be a kiss? *peeks from between hands*) However, all he does is smirk before helping her buckle in her seatbelt. (What! That was so anticlimactic!) 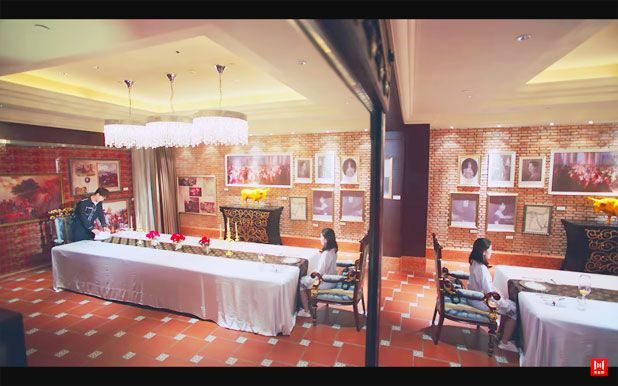 They arrive at a fancy restaurant, the kind where they’re facing each other, yet seated super far away. The first course is brought out, and Tan Er eagerly digs in, taking bite after bite. Mo Lian Cheng notes that she seems to like the dish and orders the waiter to give his share to her too. Dinner ends, and as they’re about to get into the car, it begins to rain. Mo Lian Cheng witnesses a scene and it’s of him and Tan Er ditching the car to go someplace. He shakes it off and gets in the car. Once, inside he hands Tan Er her phone, but also adding his on top. Mo Lian Cheng tells Tan Er to add their WeChat accounts so that they can communicate with each other more efficiently. She asks him for his phone password, and he replies that its 0529. Tan Er seems surprised at this and say, “Isn’t that my . . .” before cutting herself off. (Aww his password is her birthday~) She finishes adding their accounts and Mo Lian Cheng smiles. All of a sudden, he sees a scene in which two cloaked figures walk towards his car and then off into the woods. 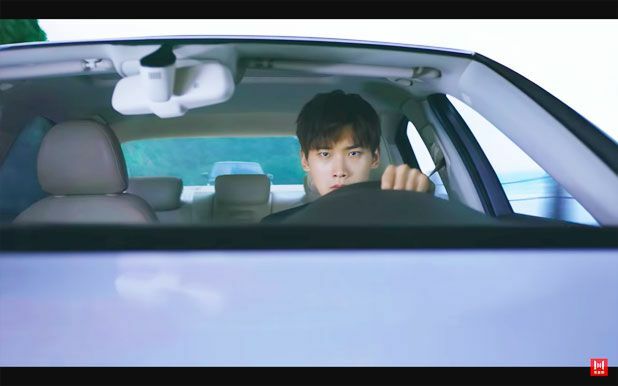 (It’s the same two villains we saw earlier, and they seem to have done something to the car or surrounding) Mo Lian Cheng panics as he quickly opens the car door and pushes Tan Er out. 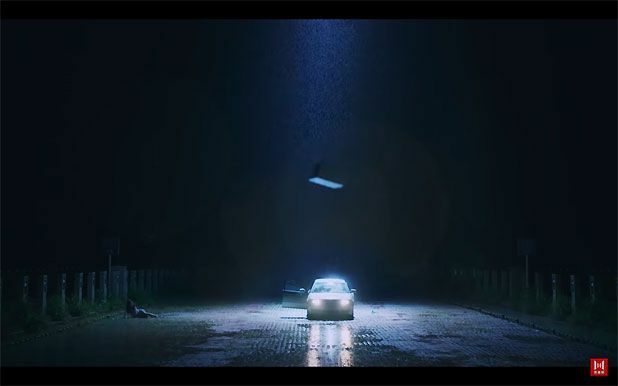 She lands a few feet from the car, and the rain seemed to have gotten heavier as it beats down on the roof of the car. He tries to shoo her away, but Tan Er insists on staying to help him, to which she starts by making him a cup of tea. 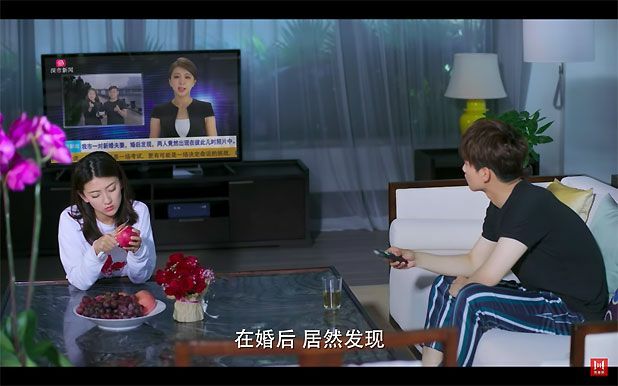 As she peels fruit for him, Mo Lian Cheng open up the TV to watch the news. A certain piece of news catches his attention, as it’s about a newlywed couple who had appeared in a picture together before they had met. The news reporter calls it fate, and Mo Lian Cheng can’t help but smile to himself. He turns to Tan Er and asks her whether it’s possible for two people who loved each other to meet again after time and space has been distorted. She calls him out on it, stating that continuing to love the same person after all that was boring. He impatiently throws the remote onto the table, causing her to lose grip on an apple. Mo Lian Cheng hears the sound and thinks that Tan Er has accidentally cut herself with the knife. He runs over in a hurry, asking her where she got hurt, only to find out that the skin of the apple broke. After hearing that, he pushes her hand aside, and Tan Er thinks he’s deliberately messing with her. She gets up to leave, but Mo Lian Cheng falls on the ground rolling in pain. She tells him to stop acting, and he quickly gets up to face her. He attempts to guilt trip her into caring for him, as he tells her that there may be after effects before wrapping himself in the blanket again. Tan Er tells him that she won’t leave and heads off to get a drink of water. It’s later on in the day, and the sky has grown dark, and Tan Er has fallen asleep next to an unfinished bowl of instant noodles. Mo Lian Cheng walks over and smiles at her sleeping state. He sees her head tilt to the side and rushes over to catch her head in his palm. He carries her to his bed and carefully lays her down and tucks her in. A flashback of the accident replays, as we see the rectangular object once again crash down right before Tan Er’s eyes. However this time, we are able to get a glimpse of the two villains faintly in the background. Tan Er stares in disbelief at the car and loudly cries for help as the rain heavily falls around her. A crowd of people start surrounding the car as they examine the scene. Tan Er cries as she tries to push the object off the car with other people’s help, and we see that Mo Lian Cheng is still alive but trapped in the car. He looks up and sees Tan Er and the side of his mouth lift up into a small smile. (He’s probably really happy to see that she does care for him! Although they just met and she seems to have forgotten who he is, at least she didn’t just leave him there alone~) The flashback ends and Mo Lian Cheng speaks to the Tan Er who’s in deep sleep, and confesses that although she doesn’t know about the future, now that he’s here in her world, he’s going to cherish her all that he can. All he wants is to be able to protect her and live peacefully with her, and no matter what it takes, Mo Lian Cheng is willing to pay the price. In the blink of an eye, it’s morning again, and as the camera pans around the bedroom, we see our two leads sleeping in the same bed! Tan Er stirs in her sleep and manages to roll herself into Mo Lian Cheng’s embrace. She once again touches his chest, causing him to wake up and smile at the sight. He picks up her hands and softly kiss them, waking her up in the process. Tan Er slowly opens her eyes and realizes who she’s in bed with. She quickly sits up and yells his name before asking him why she’s in his bed. Mo Lian Cheng pleads innocence, stating that he’s a “heavily injured patient”, so why would he know, before asking her the same question. Tan Er is speechless as she points her finger at him, not knowing what to saw. 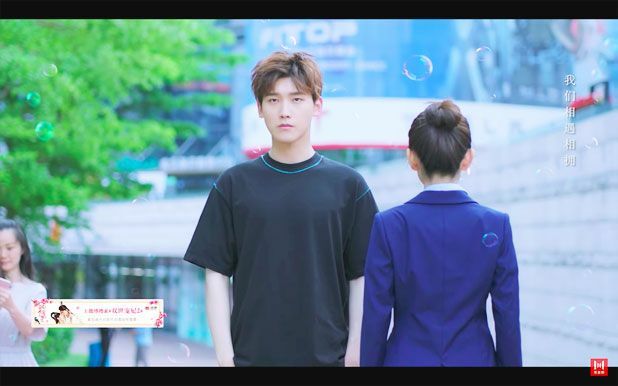 Ending thought : I quite liked this episode, and although she doesn’t know him at all, they are slowly starting to create some chemistry. They are starting over with a brand new slate, yet it’s somewhat tied to Season 1. Before the season even starts, we are already introduced to the two villains, and I already dislike them xD The drama kept it’s humor as this episode was filled with funny lines here and there. Thanks for reading my recap, and please look forward to the episode 2 recap (sometime tomorrow night). Click here to watch this episode! 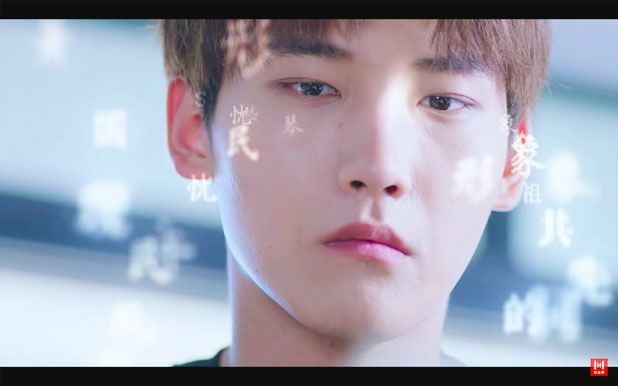 This entry was posted in Recaps & Other Thoughts and tagged Author: Fan Que, Cdrama, Liang Jie, Novel Adaptations, Sun Yi Ning, The Eternal Love (双世宠妃), The Eternal Love 2 (双世宠妃2), Wang Hao Ge, Wang Rui Chang, Webdrama, Xing Zhao Lin, Zhong Qi by Maknae. Bookmark the permalink. Hope AVIRTUALVOYAGE will upload the songs of these season to us again. I still have season 1 songs in my phone. Love the three songs came out so far. We are working on it! Please wait patiently~ Thank you! 👏👏👏 Well recapped maknae! Makes me wanna watch now 🤔 (I think that’s the thinking face? lol) but we’ll have to seeee. wow! very detailed and i loved it! i like to read other people’s perspectives and yours is a good one. this is my favorite dramas! Thank you for the detailed recap . Couldn’t understand all the catch up and tie back to season 1 and you explained it so well. Hi Katherine! Thanks for the kind comment~ As for the rose mark, it has not been explained in the dramas, so it is still unsure as to how it appeared! Quick question, due to some health reasons, I had to stop recapping for a week-ish. Would you still like me to continue recapping even though it might be behind the drama? Thanks again!